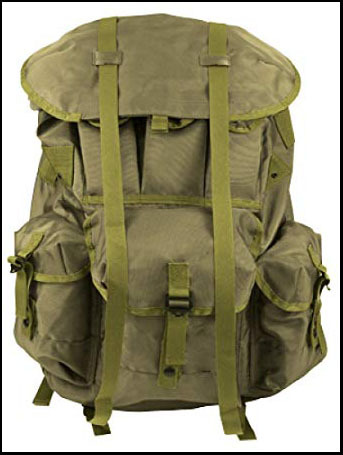 I’ll bet you 10 bucks that ALICE pack is the most famous backpack in the world – military or otherwise. This old survivalist classic been around for half a century and is still going strong. Rugged, cheap, reliable – what more could you want of a backpack? So here’s my short review of the pack. I’ll talk about it’s good and bad sides. Most importantly – how it compares against more modern military rucksacks (looking at you – MOLLE II). And if you’re wondering whether the ALICE pack is right for you – whether bugging out or going on a hike – I’ve got you covered below. What is an ALICE Pack? In military language, ALICE (All-purpose Lightweight Idividual Carrying Equipment) is a military equipment attachment system. In normal English – ALICE is the belt and the backpack of a U.S. soldier. 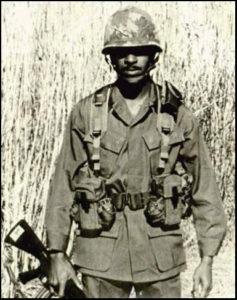 The belt: attached to which are entrenching carrier, two small cases, a canteen cover and suspenders. The pack: consisting of the bag, the frame of the bag, and the cover for the bag. 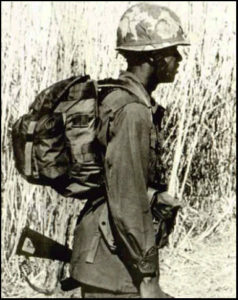 Military started using ALICE packs in 1973 (including the last years of Vietnam). 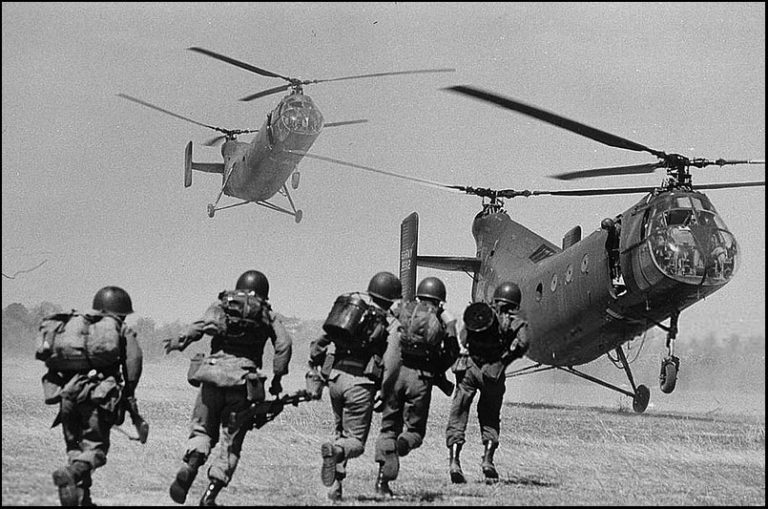 It was the main deployment pack of the U.S. military until 2001. 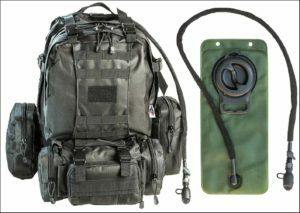 In 2001, the modern MOLLE system replaced ALICE as the main deployment pack of the U.S. Army. Note that I’ll only be talking about the pack in this article. The belt is cumbersome outside of combat situations, and you won’t find anyone using it today. But is ALICE any good now? You’ll either love ALICE… or you hate it. There’s no middle ground. And I’ll give you a hint – it has something to do with comfort. And the fact that the bag was deployed in 1973 – 5 decades ago. But let’s start with the good. What’s good about ALICE Pack? ALICE pack is one of the most rugged military backpacks ever made. It’s made out of water-resistant nylon that will stay dry and hold up to rough use. Alice Pack with a Frame – Original U.S.G.I. ALICE packs are cheap and reliable, with many parts mods available in the aftermarket. Check your local milsurp store. But also Amazon and Ebay. There’s plenty of spare parts on the market. If the shoulder straps on your bag break 2 years from now – you can be certain that you’ll find cheap replacement straps in no time. Same goes for the frame. ALICE is compatible with other military load bearing systems – which makes the pack upgradeable. 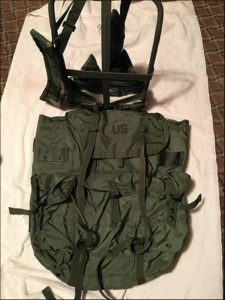 You can install a MOLLE waist belt on an ALICE pack – for example. With some cheap upgrades, you can give ALICE some of the MOLLE’s comfort. Note: check the video in the F.A.Q. for most common ALICE mods. Finally, the ALICE pack is great for carrying lighter loads. It’s not because the pack was specifically made for carrying lighter loads – it’s just that it struggles with heavier weights. What’s bad about ALICE Pack? When your loadout is heavy, carrying this pack becomes a torture. The ALICE pack is very wide, but not very tall. So when you load it up with stuff, the weight won’t be well-distributed. See where the weight will go? You have to bend to counterbalance the load. Because when loaded up, the pack will stick out from your back horizontally. Traveling long distances with a loaded up ALICE bag… is not recommended. Note: There’s a reason why the ALICE pack is wide. It was designed with jungles in mind. So that the soldiers with helmets could look up when they were laying down with the bag on. And also so it wouldn’t get caught up in the vines and other plants when going off trail. The frame is not adjustable. This means that unless you’re about 5′ 10″ – the height that the pack was designed for – you’ll struggle more while carrying it. Compare that to MOLLE bag’s adjustable ergonomic frame. ALICE can’t compete. Straps and buckles take time to open. They’re not comfortable to use, especially when compared to the MOLLE pack. Original ALICE straps are not comfortable. At all. There’s little cushioning and with heavier weights they start cutting into your shoulders. But they’re easy to replace. Finally, ALICE is heavier than some of the modern designs. You can fix many of the pack’s faults by upgrading it (e.g. adding a MOLLE waist replacement). That’ll make the pack more comfortable, while maintaining its simplicity. Check out videos in the F.A.Q. section on mods that you can make. You can find the ALICE pack in small, medium, and large sizes. Small ALICE is hard to find – and too small to be useful. So I didn’t include it here. Medium ALICE pack can be carried with or without a frame. The large ALICE is built to be carried with a frame only. Without a frame, a medium ALICE pack can carry 40-50 lbs. The large ALICE pack can carry around 70 lbs. of gear. For a bug out bag – go with the large ALICE. For something more light and portable – medium will do fine. The pockets on the large-size pack are bigger than the ones on the medium-size pack. The dimensions on your pack will depend on how you pack it. 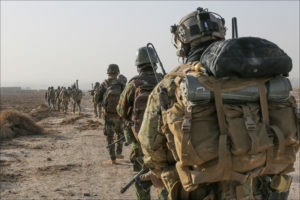 MOLLE (Modular Lighweight Load Carrying Equipment) are the deployment packs used by the U.S. military today. Is it better than ALICE? MOLLE has better weight distribution and is more comfortable to carry. Side note: countless soldiers were happy when the military switched ALICE out for MOLLE. The MOLLE pack is taller than ALICE. This gives it the better weight distribution. Your things are closer to your back. So you don’t have to bend when carrying a heavy loadout. MOLLE’s suspension system blows ALICE out of the water. You can’t even compare the shoulder straps of the two bags. MOLLE’s are thick – built with comfort in mind. Also – MOLLE has a sternum strap and a waist belt. ALICE does not. With MOLLE, the weight will be on your hips. With ALICE – it will be on your shoulders. ALICE comes with an aluminum frame. It’s durable, but heavy. Most importantly – it can’t compete with adjustable and ergonomic frame of the MOLLE pack. MOLLE is the better backpack overall from the two. Waist band and better weight distribution make the pack a clear winner over ALICE. Instead of having your weight on the shoulders, MOLLE puts the weight on your hips. Which is where it should be. You can buy ALICE packs really anywhere. I recommend getting one on Amazon because of the better quality. But don’t forget to check them on Ebay and also your local milsurp store. The price will depend on the condition of the pack (and how lucky you get). You can get a pack for as little as $25. How to pack an ALICE bag for hiking/bug out? Check the videos below to see some of the most common ALICE pack mods. How to attach a frame to ALICE pack? Attaching the frame is difficult – but only the first time you do it. Check the video below to see what I mean. 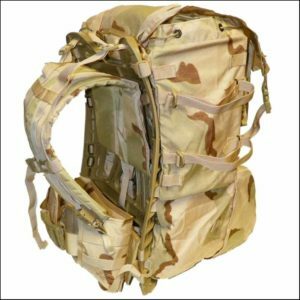 How to attach MOLLE straps to ALICE pack? Attaching MOLLE straps to your ALICE pack will make it significantly more comfortable to wear. Check the video below to see how. 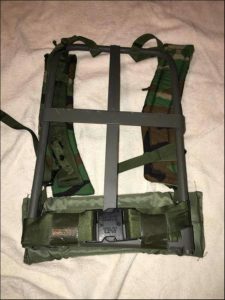 How to attach ALICE pack to a MOLLE frame? ALICE can also be attached to a MOLLE frame. If you want to ditch the aluminum for something lighter and more comfortable. How to attach shoulder straps to an ALICE pack? Again – this is the basics. Only tricky the first time you do it. How to use an ALICE pack without a frame? Medium ALICE packs can be used with or without a frame. You’ll need to keep some things in mind when removing the frame, through. I decided after trying many different types of newer modernized backpacks that I was sticking with the ALICE pack. 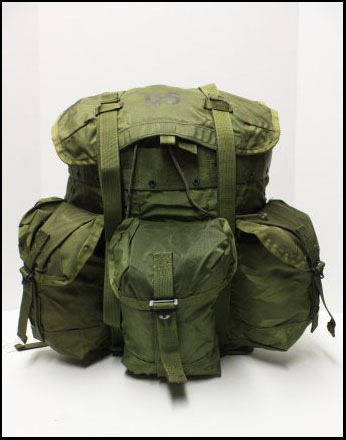 I have been using the ALICE pack since my youth in the 70s and later in the USMC and later the US. Army. I know the pack well and well frankly I”am used to it, I know its quirks and shortcomings as well as its advantages. Its biggest advantage Ruggedness and simplicity. I do have a newer MOLLE II and the writer of the article is spot on, it is better in the comfort area. Much more. However I decided to stay with the ALICE yet wanted the comfort of the MOLLE pack. I upgraded it. Replaced the frame with the newer 1606 MC and use the MOLLE suspension system. Wait Belt and Shoulder straps and added my own modifications. I now have a pack that is suited to me.